The IB learner profile is said to be the IB mission statement in action. The traits of the learner profile are the characteristics IB schools are developing in students in order to fulfill the IB goal. The learner profile therefore, provides the foundation for learning in the all programs. Understanding that individuals can improve the world, and an acceptance of the responsibility to take action to do so. What is the IBMYP curriculum? 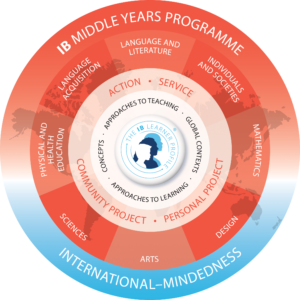 The IBMYP curriculum is an international framework of objectives that are standard to all IBMYP schools throughout the world. In 2014, the objectives were slightly revised to better link the IBMYP with the IBDP (Diploma Program). Students acquire and are assessed on skills and content knowledge in eight subject areas in every year of the program. How do I learn? What am I interested in? How can I help others? How do I understand the world? The Middle Years Programme regards these questions as important for students to explore during their time in middle school. In fact, the Middle Years Programme believes that students are the center of importance; their interests, their thoughts, and knowledge about their own learning are vital in order for education to be meaningful. Therefore, after much research, the International Baccalaureate Organization designed a program that helps teachers keep in mind what is important to students, while they teach important concepts, content, processes and skills. • achieve higher levels of critical, creative and conceptual thinking as students analyze complex global challenges, such as climate change, international conflicts and the global economy, and create greater subject depth through the study of discipline-specific related concepts. Approaches to learning skills are strategies and techniques that are applicable across the curriculum. ATL skills focus on the process of learning, helping students to become confident, independent, self-managed learners for life. Teachers explicitly teach the skills through structured opportunities and students reflect on the development of these skills. Reading, writing and using language to gather and communicate information. In the IBMYP, teachers use the six global contexts (themes) to focus the curriculum on real-WORLD issues. Through exploration of the six contexts, students learn to connect the subject matter to their personal lives and to the lives of others around the globe. What is the teaching and learning approach of the IBMYP? “Tell me and I forget, show me and I remember, involve me and I understand.” The third part of this age-old saying captures the essence of inquiry-based learning. The instructional model in the IBMYP follows an inquiry-based approach. Inquiry is a process of gaining understanding by way of active participation. Inquiry entails formulating questions based on one’s current knowledge and seeking answers in order to construct new knowledge, collaborating with others in their quest for understanding and applying their knowledge in authentic ways outside the classroom. Students also reflect on their learning and formulate their own inquiries for further study. The IBMYP is also concept and skills based. Because information is now at one’s figure tips, teaching focuses on developing students understanding of concepts that are meaningful across disciplines and that connect topics and processes in relevant ways. In addition, students practice and acquire necessary skills in the individual subject areas as well as habits of mind skills (organization, research, collaboration, making connections, etc) that are needed for success in school and for lifelong learning. The Design Cycle trains students to look at the big picture of learning and to have a personal stake in their own education. Students learn to investigate, plan, create, and then evaluate three branches of technology: information, materials, and systems. With technology at the helm, students become leaders in the classroom. Thomas Jefferson Middle School has a strong tie to technology (the actual thought process of design and innovation) and technology tools. Teachers have access to tools including digital cameras, movie cameras, SMARTBoards, wireless slates, and lcd projectors. Teachers also have access to various software and video programs to support instruction on just about any topic.